129. 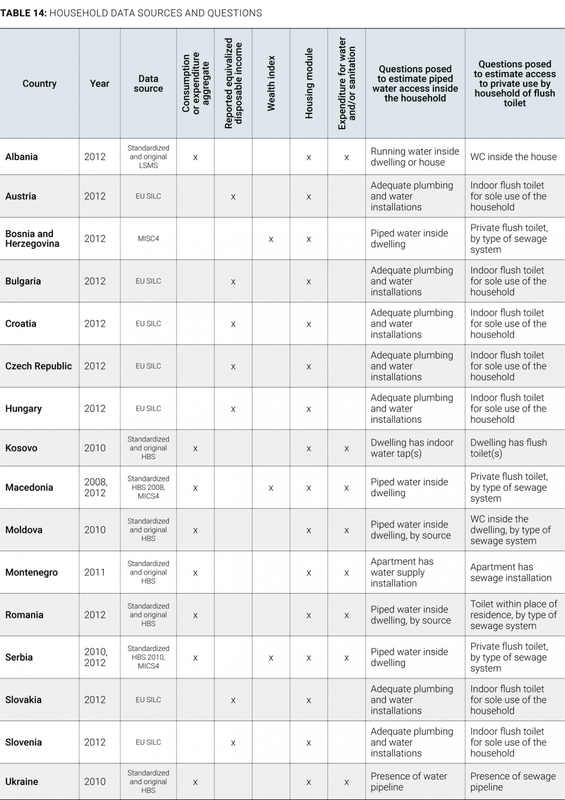 Statistics reported on access are drawn from two sources: household survey data in the case of piped water and access to flush toilets, and country data collected by consultants in response to the Danube Water Program (DWP) country survey questionnaire on access to public piped water and access to sewers. The methodological discussion here refers to the estimation of statistics using household survey data, since these datasets are heterogeneous and require interpretation and definition. 130. Income/wealth proxied by consumption expenditure, self-reported disposable income, or wealth index. The household surveys used in this analysis report different variables that can proxy for income, which is necessary to sort households into quintiles or to compute shared prosperity indicators. While the Living Standards Measurement Survey (LSMS) applied in Albania and the Household Budget Survey (HBS) applied in non-EU countries and Romania, are similar in the way they estimate income/wealth (that is, from consumption or expenditure of households), the approach is very different and yields potentially different outcomes from self-reported income, as applied in the European Union Statistics on Income and Living Conditions (EU SILC) collected by EUROSTAT, or from an asset or wealth index, as estimated in the Multiple Indicator Cluster Surveys (MICS) collected by UNICEF. Moreover, a wealth index prepared in the MICS can only be used to sort households into quintiles, but does not give information on the distance of wealth between households and, since it does not include consumption/expenditure, cannot estimate statistics for the poorest households, as defined in this report as those living on less than $2.50 a day purchasing power parity (PPP). 131. Measuring access to piped water and sanitation at the household level. As outlined in table 14, each survey poses slightly different but often similar questions that are used to inform on access to services. Several questionnaires, especially the MICSs but also some of the HBSs, have even more detailed information on access to services that has been analyzed but not used in this report. The most dissimilar question is being posed in the EU SILC with respect to piped water, perhaps because it is implicitly assumed that households in EU countries mostly have piped water in their dwelling, so the question posed relates to the quality of that installation. Likewise, country surveys rarely specify whether household access to a flush toilet implies access to a sewer system, a septic tank, or nothing, and never do these surveys inform whether sewage collected is treated, since the household may not know the answer. 132. Statistical significance. When estimating access by income/wealth quintiles, ethnicity, region, or shared prosperity indicators, special attention was paid to whether the estimated indicator is statistically significant by checking both the standard errors of the estimate (that is, large standard errors relative to the mean are indicative of an estimation problem) and the design effect (deft), which shows how much the sample standard error varies by applying “cluster” sampling (typically applied in surveys) as opposed to simple random sampling. A well-designed sampling framework would typically generate a deft between 1 and 3, with 1 being associated with a lower standard error and reflecting equal standard errors between cluster and simple random sampling. On the basis of these two checks, two indicators for the affordability analysis (discussed under point 4 below) are not being reported. 133. Data verification. All statistics have been estimated using population weights to generate population estimates on access. Since the number of observations inflate from sample to total population size, one verification possibility entails whether population estimated from the survey is approximately equal to the population of the country in that particular year. The other verification method applied was to compare average estimates on income and access with other available data reported on these statistics. In the case of piped water access, estimated statistics were compared with the statistics prepared by the Joint Monitoring Program, and in the case of income, sources including from the OECD and poverty assessments prepared by the World Bank were consulted to draw comparisons. On all accounts, the estimated statistics are considered robust.